A century ago, on June 28, 1914, the assassination of Austrian Archduke Ferdinand initiated the cascade of events that led up to World War I, whose mindless mechanized mass murder was only matched by the genocides in World War II. 1914 is a century away. Even amongst the very old, the year is but a long, faded, distant memory. 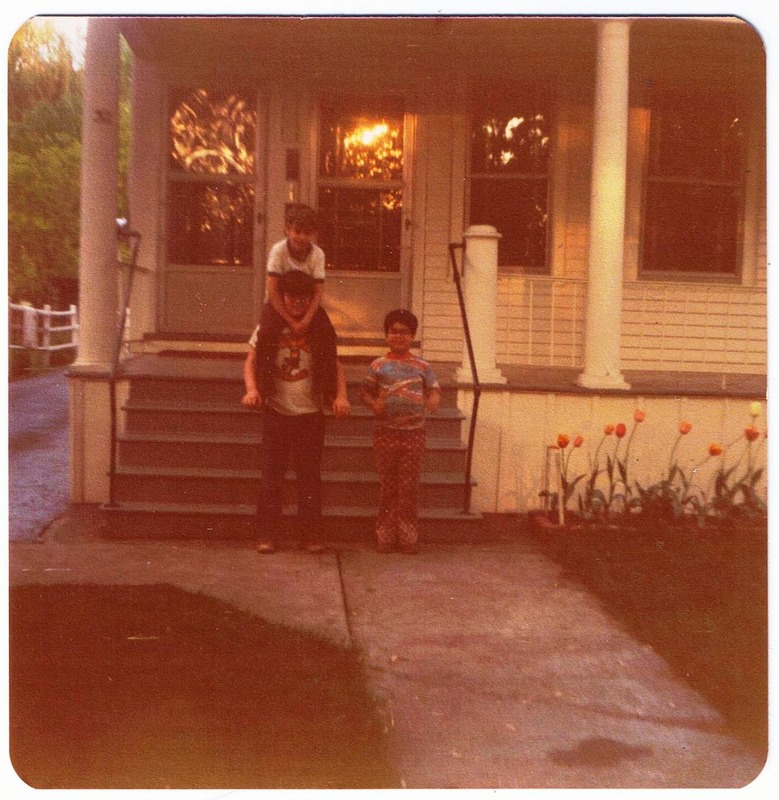 ﻿﻿In the late 1960s on Norwood Avenue, in Albany, NY, lived our neighbor, an old man named William. I was about four years old and William was an object of curiosity to me due to what I thought were his magic growing legs. One day I would see William walking around his garden and the next day I would see him in a wheelchair without any legs. I was at once both intrigued and terrified. In my young mind, I wondered if I would lose my legs too and whether or not I could also grow them back. circa 1975. He lived on the right. ﻿﻿As a child, before I had even begun kindergarten, I became aware of the ravages of war. My mother lived in Sicily during World War II and survived the Nazi-occupation of their village following the fall of Mussolini. From an early age, she regaled me with tales of wartime terror (see News from the Front: Memories of a World War II Refugee). I remember one childhood visit to our neighborhood grocery store about the same time I became aware of William’s magic growing legs. Built in the 1920s when the neighborhood was first developed, the store retained its quaint old features, including an elevated platform near the center aisle from which the store manager would supervise the whole operation. George the Grocer worked the fruit and vegetable aisle just behind the cash registers. Tell George what you want and he would make sure you got the best available. He spoke with a thick German accent that stood out in the Anglo-Irish-Italian neighborhood. On that visit, my mother took me by the hand to George and said, “Show him — it's ok.” George looked down at me with soft, grandfatherly eyes and rolled up the sleeve on his left arm. I could see a series of numbers tattooed on his arm. I don’t remember them all, or the order, but I recall a couple 1s, a 3, a 7, and a 9. Odd I do not recall any even numbers. ﻿﻿Later, my mother asked if I remembered the stories of the Nazis who occupied her village during the war. She said these same Nazi’s arrested Jews and sent them to camps and put numbers on the arms, just like prisoners get numbers. They tattooed them on so everyone would know they are Jews and were to be executed just for being Jews. George was one of those who survived until the Germans were defeated. Keep in mind, I was all about four or five years old at the time. On one hand, I looked at it as ancient history, like the Romans and the Christians I learned about in church, yet here were the victims — William, George, and my mother. If they were alive, then the past wasn’t that far behind. If it could happen to them, it could happen to me. That is what frightened me then, and continues to do so to this day. ﻿﻿﻿﻿﻿﻿﻿﻿﻿﻿﻿﻿﻿I was frightened of William, so in an attempt to alleviate my fears my mother introduced me to him. He was in his wheelchair at the time and laughed when I asked about his “magic growing legs.” He was a kindly old man and said that he had artificial legs to replace the ones he lost. He rubbed the stump of his right knee and said that they sometimes hurt and he couldn’t wear them all the time. “You lost your legs?” I wondered aloud, asking as though he lost a watch or a wallet. He gently laughed and replied that he lost them in World War I, which my mother explained was the war before her war. It all seemed like ancient history to me, yet here he was. Later on, she explained that his legs were shot off by a machine gun when his unit attacked the Germans. As a child, it was a concept hard to digest between spoonfuls of Count Chocula. William died a few years later. I cannot read about World War I without ever thinking of him, even briefly. I knew him in the late 1960s and early 1970s, so he must have been a very young man when he fought in the war, yet he lived a long life. I know nothing else of him, but can only hope the years he lived were good ones. Twenty years and 65 days later, his words came true. Still, as we remember Foch’s warning, we should also heed Benjamin Franklin’s advice, “There is no such thing as a good war, or a bad peace." Nevertheless, as we look over post-World War II history, there are still too many people looking for the next good war and impatient with peace. To the world, World War I is a century away. To many people, World War I is only a few forgotten paragraphs in an old school book — to me, it is only ever a thought, only ever a lifetime away.